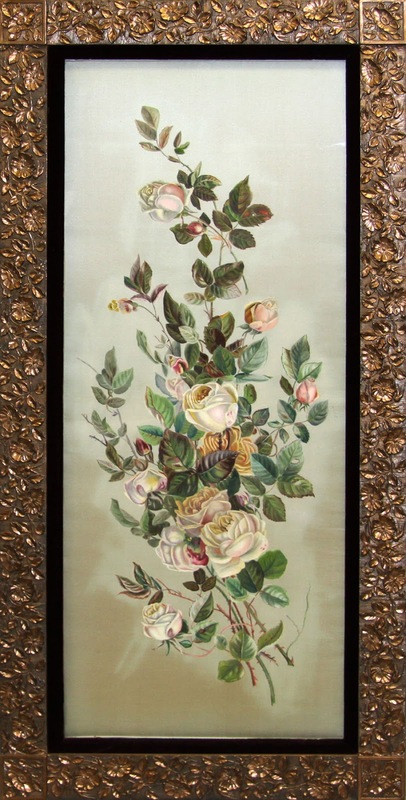 This beautiful painting on silk with a red velvet mount, and a copper leaf frame is part of the Johnson Collection. Since it is not signed we do not know for sure who is the artist. Grace Bonebrake Johnson, a daughter of the Bonebrakes who moved to Boulder Creek in the early 1900s, was an artist. She never signed her work; sometimes she would "sign" a date. 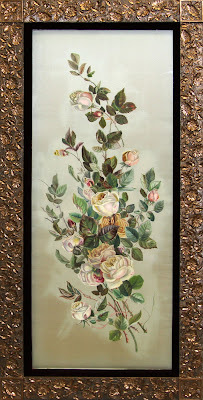 This work may be attributed to her. She died in 1915 in the garden of her parents home in Boulder Creek. Grace's daughters inherited, and lived in, the home on West Park Avenue until they died. The property was bequeathed to the local Historical Society and to the Local Recreation and Parks district. Unfortunately, it was not possible to turn the home into a House Museum, and the house was sold to fund the purchase of the San Lorenzo Valley Museum building, now a National Register Building. The plot of land next to the Bonebrake-Johnson home on West Park Avenue is now home to a Hereford cow.